A few years back I was at Anime Banzai's Cosplay contest when these two came on stage. The duo of Crepuscular Cosplay had everything; fantastic wigs, killer props, intricate sewing and complex design work. Their cosplays are really amazing! It has taken me a few years, but I have finally plucked up the courage to ask them to be on the blog and share their talents!! As a team, these two split their responsibilities well. Jazzy takes on the wigs and sewing work, while Dustin tackles weaponry and armor design. They both try to learn from each other to expand their individual skill sets as well. Jazzy is so good with wig work that she was a part of an Arda Wigs photo shoot!! 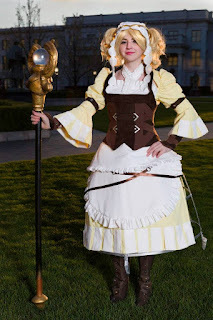 Why the unique cosplay name? Jazzy: Omg because I texted Dustin and asked him to describe us in one word and he made an Archer reference. How long have you both been cosplaying? Jazzy: We started in 2007 but we weren’t cosplaying together at that time. Dustin: We met through mutual friends in high school, and started dating when we graduated. 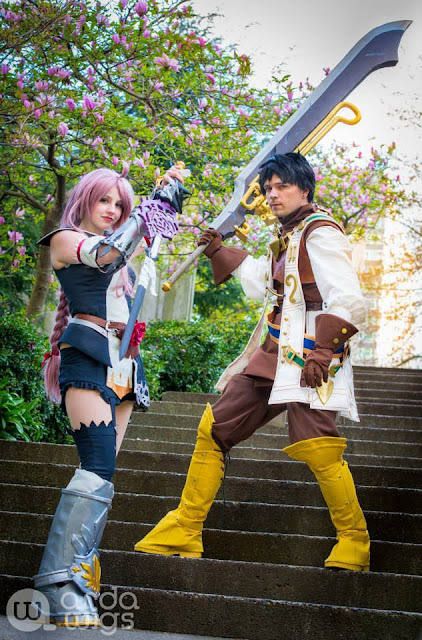 You two make an amazing crafting team and cosplay duo. Who is in charge of making what when you start a new build? Jazzy: Dustin does all the props and armor and I do all the wigs and sewing. We both work on smaller accessories, charms, that sort of thing. We’re trying to get more experience in each other’s area though. Dustin: Even though I typically make the props and armor, and Jazzy does the sewing and wigs, we are trying to branch out further, so that I can do my own sewing and Jazzy can make her own props and armor if that's necessary. Jazzy, how long have you been working with wigs and why? Wigs are really tough part in cosplay and you are very talented with them. Jazzy: Thanks. 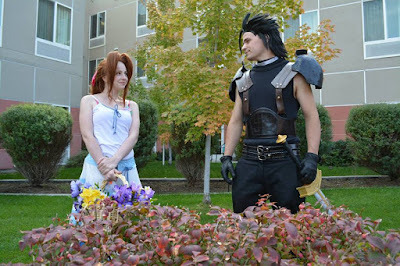 2011 was the first year I actually styled a wig and it was Kingdom Hearts Cloud so I pretty much jumped into the deep end with wigs. I just really love the process and view each wig as a personal challenge. 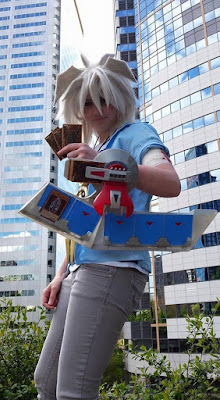 I like to make characters like Yami Bakura for me or N from Pokemon for Dustin just to see if I’m able to do it. 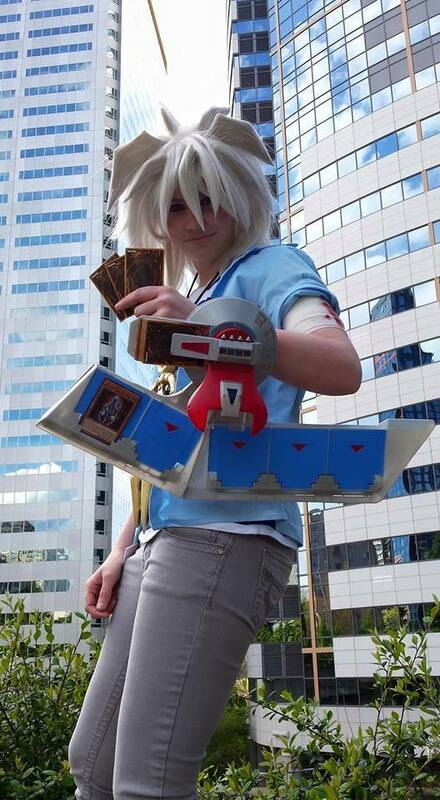 Jazzy as Yami Bakura from Yu-Gi-Oh! This is one of Jazzy's favorite wigs! It ties for first with her N wig. Question for Dustin: since you are in charge of props and armor, what drew you to these skill sets? Dustin: I never knew how to sew. 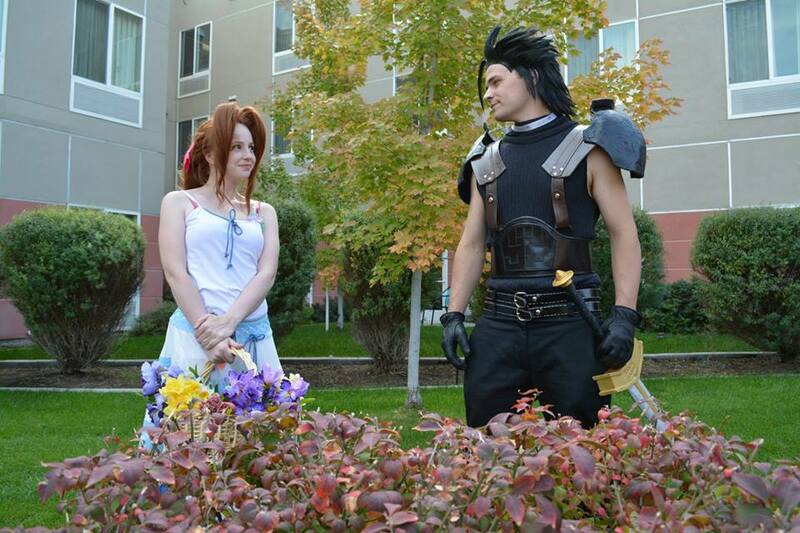 Even on my first costume ever (Zabuza from Naruto), any of the clothing that wasn't purchased was sewn by Jazzy. However, I had access to wood and saws and sanders, and even though I had pretty much no skill in prop-making, I just started cutting, sanding, nailing and gluing until I had a sword. After that, I just kept at it, making the props and armor and continuously learning all this new awesome stuff. 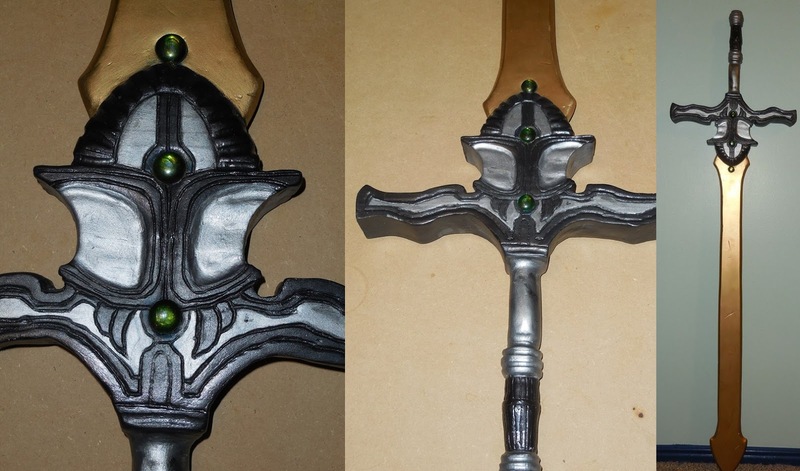 How long does it take to work on a cosplay set on average? Jazzy: We probably log about a 100 hours per costume on our main set. Jazz and Claves were definitely the most time consuming costumes we’ve made. Dustinl: I don't keep an exact record. We space it out here and there throughout a few months or so to make a costume. Dustin: My favorite costume has been Ike, from Fire Emblem. 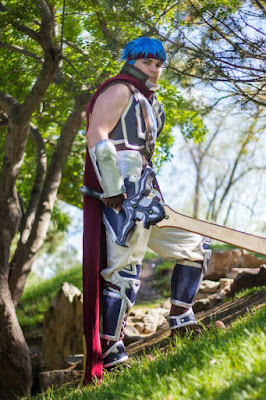 Even though Jazz from Eternal Sonata is more advanced, I have a bit more of a personal connection to Ike as a character, and Ragnell has always been my favorite prop that I have made. Jazzy: I have a couple for different reasons. Strictly costume-wise Claves is my favorite. Visually there is nothing about that costume that I don’t love. Character-wise Bakura is my favorite. I love Yu-Gi-Oh! and I really, really love Bakura. Jazzy's favorite wig, N from Pokemon actually ties with her Bakura wig! 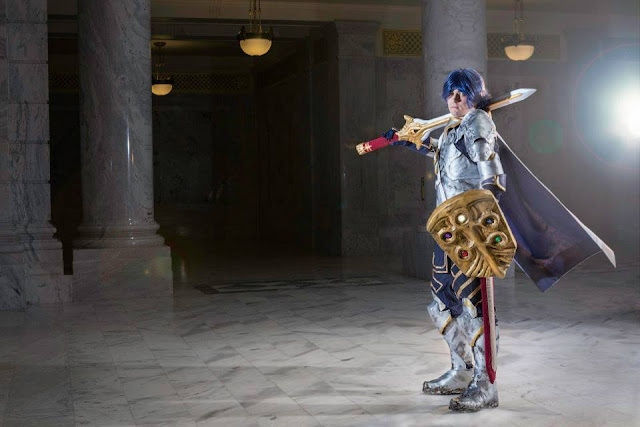 What is it about cosplay that makes it such a big part of your life? Jazzy: Cosplay has such a huge impact on my life because I have major health issues that keep me from being able to work or really get much social interaction. It’s a hobby I can bury myself into because it has so many different elements and when I get to go out and wear my costumes with other people and relate to them in such an awesome way it makes up for all the social interaction I’m missing out on. Dustin: Cosplay is something that we have done together as a couple. Even though we first started separately, I love working with Jazzy and crafting on my time off, just hanging out, making props, and having fun. Being in costume is really fun, but it's the journey of creating the costumes with Jazzy that I love the most. What advice would you give a cosplayer who wants to try wig work or prop making for the first time? Dustin: For my advice to someone who wants to try prop-making for the first time: just go start it. I had absolutely no clue what I was doing when I began to make props. Little by little, I grew. Go read tutorials, go research materials, go get all the knowledge you can, but most importantly: just keep working at it, and you'll keep improving. Jazzy: Unless you have a really tight budget getting a quality wig is worth the price. Remember that wig heads are a lot smaller than the average human head so work slow and cut long. It takes getting used to but it gets easier as you go.